We offer a full screen printing and embroidering service, from clothing supply to re-labelling and expert distribution throughout Europe. We aim to deliver all orders within a maximum timeframe of two weeks, and most are completed within 7- 10 days. We also offer a 48 hour express service for urgent orders, subject to technical requirements, where possible. Many of our customers are corporate gift houses, demanding both high quality and competitive prices. We will help you to determine the best finish for your brief as well as which stock to use. All major clothing brands are available at distributor prices or even lower. 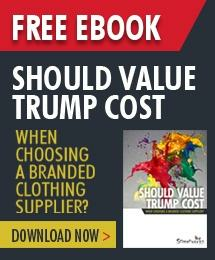 The actual cost will depend on the chosen design, the type or brand of garment and the quantity required. There are other variables, including the number of different colours per screen printed design and the number of stitches which make up an embroidered design. We can provide guidance regarding both finishes and garments – a free no-strings quote will be with you within 2 hours of your enquiry. New designs are subject to a set-up charge for both print screens and embroidery programmes. These costs vary again according to the number of colours (printing), or the number of stitches (embroidery) and will be detailed clearly in the quote. All the print screens we use are held in storage for 6 months; if you re-order within this period no further set- up fees will be incurred. If after 6 months a repeat order is placed, a print screen re-make charge will apply. Our automatic printing machines can produce runs of 25 and over per design. Our embroidery machines produce runs of 12 and upwards per design. Screenworks’ total output is up to 125,000 units per week.